2011 Aprilia Dorsoduro 750. Picture credits - Aprilia. Submit more pictures. Now Aprilia has taken its success story one step further with the Aprilia Dorsoduro 750, the machine that sets completely new standards for the road-going supermotard market. 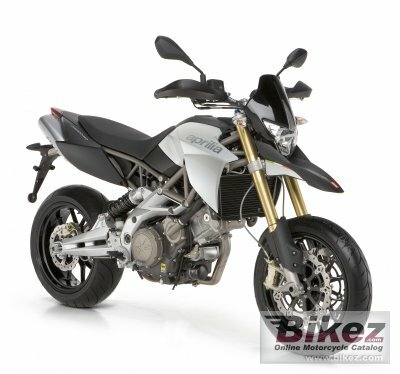 The Dorsoduro is Aprilia�s first 750 cc supermotard, with a level of performance and equipment that places it in direct competition with far bigger machines. Front suspension: 43 mm upside-down fork. 160 mm wheel travel. Rear suspension: Aluminium alloy swingarm. Hydraulic shock absorber adjustable in spring preload and rebound damping. Wheels: Aluminium alloy. Front: 3.50 x 17�. Rear: 6.00 x 17�. Ask questions Join the 11 Aprilia Dorsoduro 750 discussion group or the general Aprilia discussion group. Get a list of related motorbikes before you buy this Aprilia. Inspect technical data. Look at photos. Read the riders' comments at the bike's discussion group. And check out the bike's reliability, repair costs, etc. Show any 2011 Aprilia Dorsoduro 750 for sale on our Bikez.biz Motorcycle Classifieds. You can also sign up for e-mail notification when such bikes are advertised in the future. And advertise your old MC for sale. Our efficient ads are free. You are also welcome to read and submit motorcycle reviews.